Red Dead Online is pretty amazing with its character creator – capable of some pretty amazing things in the right hands. With a little time and creativity, your character doesn’t have to look like a toothless outlaw who hasn’t showered in a week. If you’re having some trouble making your character look less… ugly… check out the 5 Red Dead Online created characters below, and find out how you can steal their look. ⚠️ Warning ⚠️ you’re going to want to start over and remake your current character after seeing these amazing examples. Sometimes, if it ain’t broke, you don’t need to fix it. Rockstar Games spent a lot of time perfecting Arthur Morgan’s look, and now you can keep it in Red Dead Online. You can read more information about /u/AndrewtheKingArthr’s creation in their Reddit post. Also, don’t forget to thank them for their helpful guide! After that, all that’s missing is a horse named “Bob”. This burly character was created by u/bus10, who also named him “Hans”. Hans looks like he doesn’t take crap from anybody and, as u/bus10 informs us, Hans is from Austria and “he only drinks beer.” Want your Red Dead Online character to look as tough as Hans? Here’s what u/bus10 says you need to do. “From what I can recall its head 12, body build brawny, eyes furrowed, nose neutral, mouth high, jaw squared, ears small, and cheeks neutral;” u/bus10 tells us in the comments of their Reddit post. You’re also going to need to use the “leftmost skin tone” to achieve that beautiful “Austrian” complexion. For the powerful mustache, try selecting one from a barber in-game if you can’t find one you like in the character creator. If you can’t tell, this look was inspired by the demon-slaying character “Dante” from the Devil May Cry series. But, this character is still amazing looking even without their accurate resemblance to that gaming icon. We didn’t even think it was possible for characters to look like this in Red Dead Online. Here’s another look at this masterpiece. Reddit user C0NT0RTI0NIST provides a few tips on how to recreate this eye-catching look. You’re going to need to choose “Head #3” in the character creation menu, crank the age down to 18, and then turn off all lifestyles and facial hair options. That should provide you with a good starting point. But, what really makes this look is the long red coat and bare chest underneath– don’t forget that! Meet Danny Lockhart. 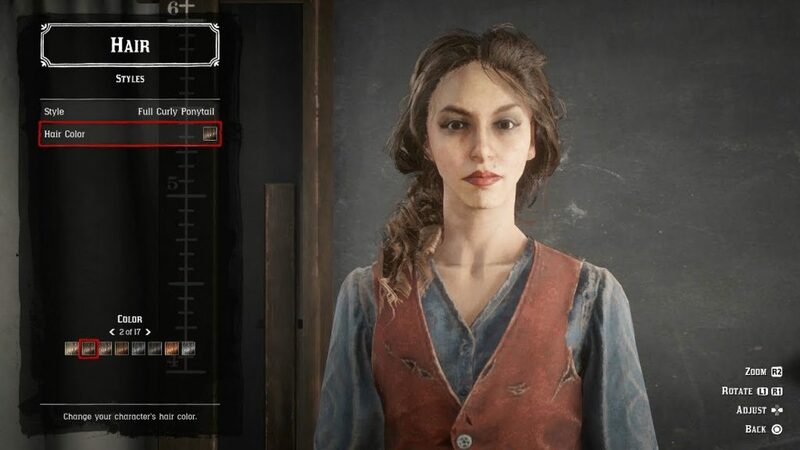 She’s the leader of the Lockhart gang according to her creator u/Suterusu-shin on Reddit. She’s also one of the most amazing Red Dead Online created characters we’ve seen. Unfortunately, u/Suterusu-shin didn’t provide every detail to completely recreate this look for yourself. But, they did tell readers in their Reddit post that it only took about an hour to design Ms. Lockhart. We also know that you’ll need to use head #11, and keep most of the presets neutral when working in the character creator. Red Dead Redemption 2 is now available for PS4 and Xbox One in our webstore. Which of these Red Dead Online created characters do you like the best? Let us know in the comments below, and feel free to share your creations or let us know if you’ve found even better ones!